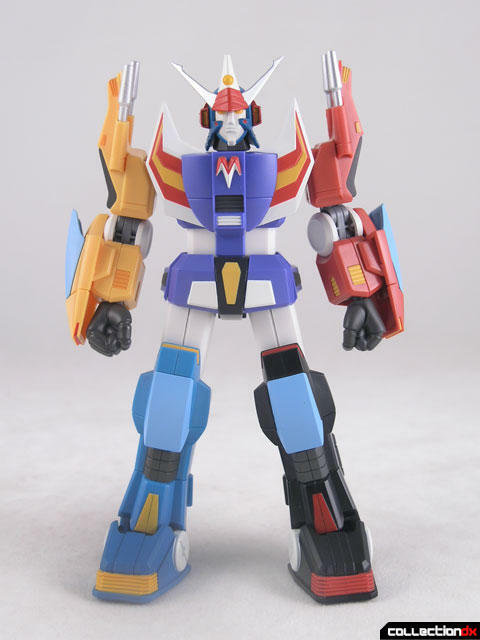 How crazy is it that we are getting toys of all these unloved 80s robots? 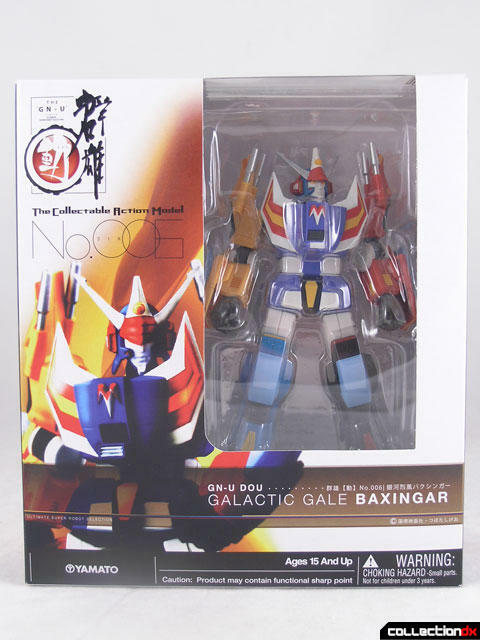 Baxingar is from the 1982 anime series Galactic Gale Gaxinger (銀河烈風バクシンガー). People refer to it as both Baxingar or Baxinger. It is the sequel to Braiger, which also got the GNU treatment. He arrives today courtesy of Angolz.com. 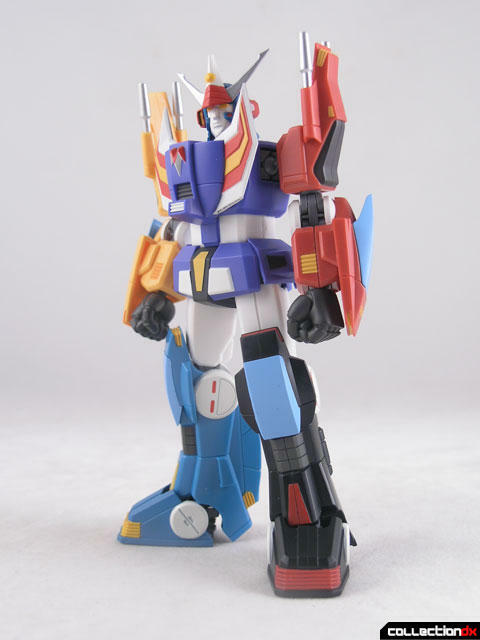 While Baxinger is relatively unknown in the US, some may be familiar with the bootleg of the Beserk Combination Baxinger from Takatoku, which flooded dollar stores and flea markets as "Motor Jumbo" or "Mustanger". As far as I know the show never aired in the US. Yamato has brought Baxingar back to the spotlight with their GN-U Dou release. It uses the same GNU skeleton as the previous releases. I have to say, I always thought Baxingar was kind of stupid looking. However, looking at it now in this GN-U format it is actually very nice. I just think maybe the character never got the toy it deserved. 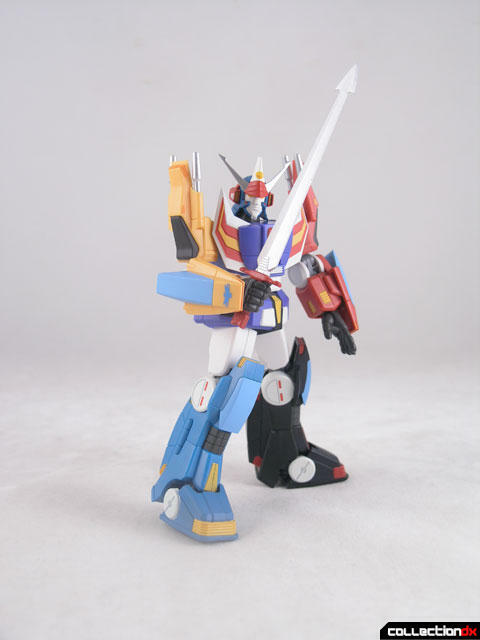 The outer shell is made out of hard ABS plastic while the fists are made out of PVC included with this release is one variant hand, and one sword with the hand molded on (which, IMHO, is they way they all should be done). 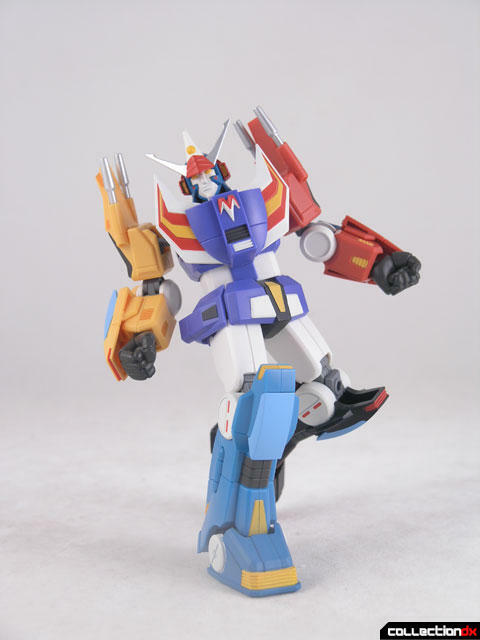 Its really nice, good quality, pretty poseable, but the character is so obscure.. It's hard to justify the price, considering the lack of accessories. 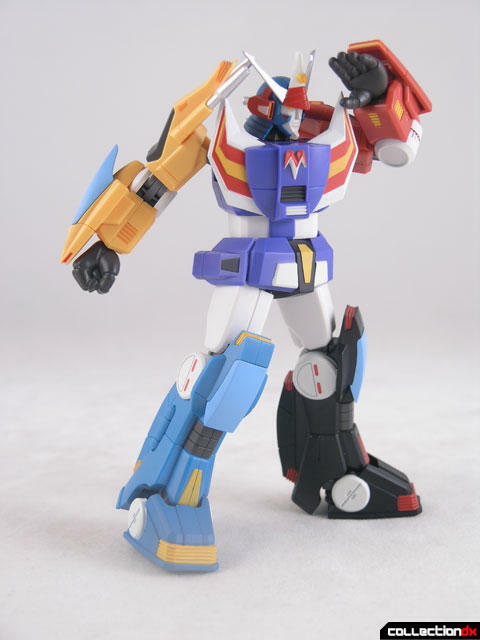 I know its a common price point for all GN-U Dou figures, so whether or not this is worth it to you depends on your love for Baxingar. To satisfy your Baxingar cravings, head on over to Angolz.com and pick one up. In my humble opinion the Berserk Combination Baxinger form Takatoku is a cool toy, is one of the few combiners from the 80's that can transform in bikes, and the bikes looked cool... I love bikes. Don't get me wrong, the thing is crowded whit flaws, too many pieces, the obnoxious leg piece, the lack of movement. But I love it. This one from Yamato is a nice rendition of the anime, finally some one notice this Bot and finally a Baxinger toy that can move the way a toy is suppose to, But the more memorable aspect of Baxinger are his bikes. I had the old Motor Jumbo toy back in 85, I loved that toy and it was dubbed the "Motorcycle Voltron" by everyone that saw it. The bikes were cool, they shot missiles, and I would put GI Joes on them, which made it extra cool. 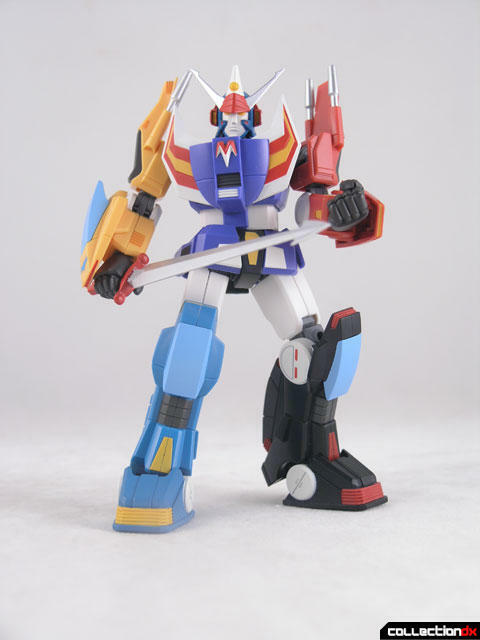 Nostalgia alone will make me get this one, and make me hope a proper figure with transformation will appear from Yamato or CM's in the future. 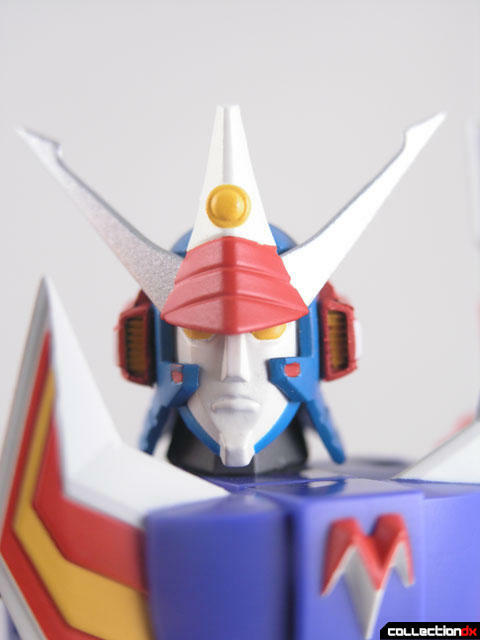 I just saw the Yamato is already planning accessory packs and stands for current releases. One of which is a new sword and backpack unit for Baxinger. I'm not too pleased that those weren't included for the price, and more money is needed to get parts that really should be in the box initially. Now we just need Acrobunch! you work the sweet side, and i'll manage to embitter it.